Can Zero Be a Negative Quantity? Yes, If It Is a Zero-Deficit Budget! Helga Zepp-LaRouche is founder of the international Schiller Institutes, president of the Schiller Institute in Germany, and chairwoman of the German Civil Rights Solidarity Movement party (BüSo). A [PDF version of this article]appears in the December 9, 2016 issue of Executive Intelligence Review and is re-published here with permission. December 3, 2016—Every day it becomes more obvious that there are two utterly opposed global paradigms that determine the behavior of nations. While opposition to the bankrupt paradigm of globalization becomes stronger and stronger in the trans-Atlantic world, and the Establishment tries to hold on to it ever more doggedly, the nations cooperating with the New Silk Road—with increasing clarity—are committed to the creativity of their peoples and to cooperation on the common aims of mankind. 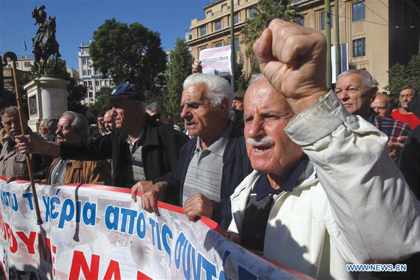 Thousands of Greek retirees rally in central Athens, against the fresh round of pension cuts implemented by the government under bailout agreements. The Western politicians and media who are accustomed to seeing Russian President Putin only through the lens of demonization, would do well to read through Putin’s December 1st State of the Nation address before the Russian Federal Assembly, without prejudice, for once. Since the rejection of Obama—because Hillary Clinton’s defeat was also that—and the first telephone conversations that Donald Trump had with Vladimir Putin and Xi Jinping, a real opportunity for normalizing relations among the world’s three most important nations has opened up. And only a suicidal fool would throw away this opportunity. 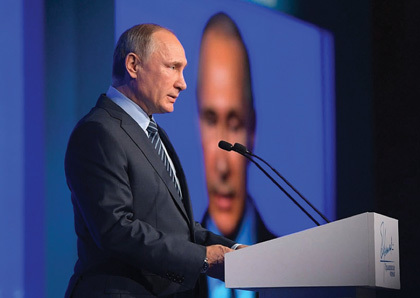 Later on in his speech Putin stressed—as priorities for the educational system—the fostering of knowledge and morality as the prerequisite for the viability of society. The interest of young people in national Classical literature, culture, and history must be awakened, he said. The schools must promote creativity, by the children learning to think independently, and learning to work both on their own and as part of a team, to master exceptional challenges and formulate and reach goals. Admittedly, gifted education is important, he said, but in principle, the educational system must be based on the understanding that all children and teenagers are gifted, and can achieve success in science, the creative fields, and life. The task of the state is to foster their talents. Vladimir Putin addressed the Primakov Readings International Forum in Moscow, Nov.30, 2016. Putin also underscored the fundamental importance of basic research as the basis for economic growth and social progress. More than 200 laboratories have already been established, he said, that are in a position to operate on the global level, thanks to very large subsidies, and which are led by scientists who have identified the trends in global scientific developments. In this connection, he said, it is also important to overcome the bottlenecks which have existed in Russia since the time of the czars by utilizing these scientific advances in the production of commercial goods. But the white paper goes much further. It clearly shows that China’s model for development and China’s political and social structure has achieved unqualified success. And while the model continues to develop, it is at a pace and in a form that is determined by the Chinese people themselves. The paper notes that China has already raised 700 million people out of poverty, now with only 5.7% of the population living under the poverty line, making it the first nation, the report notes, to reach the UN’s Millennium Goals. But China is determined to eliminate poverty altogether. The Chinese government outlined a strategy for entirely eliminating poverty among the rural population by 2020 in its “Outline of the 13th Five-Year Program for the National Economic and Social Development of the People’s Republic of China,” published in March 2016. Anyone who does not want to listen to Putin or China can study a white paper by the heavy equipment company Caterpillar, builder of machines for construction, recently reported on in Chinese media, on the significance of the Belt and Road Initiative. This initiative will unleash “a new wave of prosperity” for China and the rest of the world, it says. The construction of an infrastructure network—one of the initiative’s priorities—will make possible the free flow and efficient utilization of resources, market integration, and coordination of economic policy among nations. The construction of the infrastructure will help lower the costs of logistics, boost the competitiveness of the emerging economies, and reduce inequality among nations. Caterpillar considers the “Belt and Road” initiative to be an “open and inclusive” framework which will permit all the countries along the routes to participate in construction of the project. “It is not intended as, and cannot be, a solo effort of China,” according to the white paper. Caterpillar values the business opportunities opened by the initiative, and hopes to be able to participate even more in projects along the routes, explained Chen Qihua, Caterpillar’s Vice-President and Chairman of Caterpillar China. Moreover, western politicians and media should finally realize that there is broad support in the population for international cooperation, especially in the area of scientific and technological progress. The Citizens’ Dialogue of the European Space Agency (ESA), which has 22 member states, revealed that 88 percent of those it surveyed support the agency’s space program, and 96% are convinced that space offers opportunities that do not exist on Earth, but should be pursued. In his report on this survey at the “Frieslandmahl” celebration at Upjever Air Base, former German astronaut Thomas Reiter, now chief ESA coordinator of International Space Station Affairs, said there is reason to be optimistic in spite of the endless budget controversies at the European level. The EU8 billion spent on the space program during the past five years, he said, have generated EU14.5 billion in economic benefits for Europe and its citizens. Reiter was also optimistic about the lunar dimension of space development, particularly on the far side of the Moon. It may serve as a launch site for deep space missions in the future. The common denominator for all of these statements is this: Mankind’s future lies in nations cooperating for the economic development of the entire world, and for the common aims of mankind, especially in the development of technology, science, and human creativity. It is well worth investing in such cooperation. Whoever does not understand this, and instead sets his sights on a zero-deficit budget, will end up empty-handed.
. Xinhua, “Belt and Road Initiative Presents ‘Enormous Opportunity’:Caterpillar,” Nov. 30, 2016: http://english.cctv.com/2016/11/30/ARTInmTMtudyIbAMdCXsUfBJ161130.shtml/. 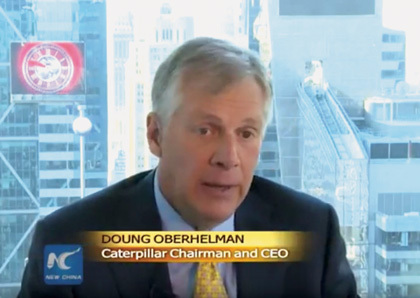 Caterpillar Chairman and CEO Doug Oberhelman had expressed this optimism in speaking with New China TV in September 2015: https://www.youtube.com/watch?v=y1SQ8Phput4/.